I know, Movie Mind enthusiasts…that may come as a stark revelation to those of you who have been locked up in nuclear fallout shelter for the last 35 years ala Brendan Fraser in Blast from the Past. For the rest of us, this is nothing more than a proven scientific FACT that we have known for some time but thankfully managed to just not care about. 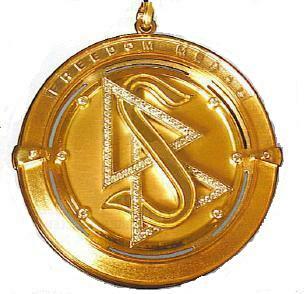 That is of course….until recently as videos have flooded the worldwide web showing Tom Cruise receiving some award-for-crazy-people from the Church of Scientological Views [Editor's note: not the real name of church, see explanation to follow] in all his nutty glory. These videos have, however, managed to disappear from the vast worldwide web as fast as you can say Tom Cru – see, another one just disappeared. I was originally going to post a link to the aforementioned insanity, but every time I found a seemingly “brand new” link to it, there was an accompanying message that read something like this: ” The file was deleted because of violating our Terms of service” or even this note from the YouTube folks: “This video is no longer available due to a copyright claim by Church of Scientology International”. Ok, this creeps me out more than Cruise’s antics when he was on Oprah. Can you just picture TC sitting in some underground lair banging away on a keyboard while the ghost of L. Ron Hubbard whispers messages to him as if he were Patrick Swayze talking to Whoopi? These guys have staked claim to any link and/or mention of this video and somehow had it removed from the ENTIRE INTERNET. Do you understand the gravity of that? Don’t you think if it were that easy to do every drunk teenager that had something regrettable show up on the internet would have done it? So here is The Movie Mind giving in to the cultish bullies of Scientific-ology [Ed. Note #2: I am afraid to even mention it by its real name for fear of TC’s cronies (I am picturing the Agents from The Matrix, by the way) waiting for me outside my house holding a water-boarding chair] and wishing that I had not even had the displeasure of listening to the aforementioned video. 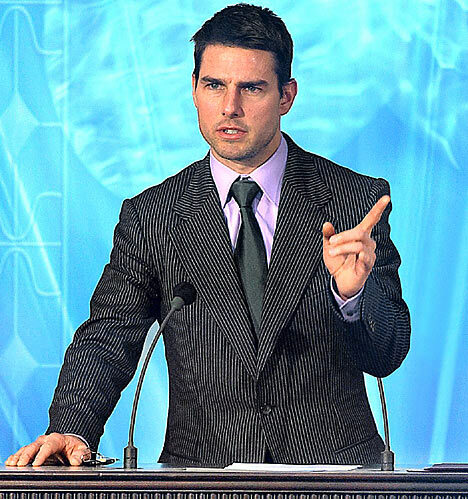 I don’t know if Tom Corresh- I mean Cruise, is an alien, or just your run-of-the-mill weirdo freak leader of a cult, all I know is that I never thought it was possible to be scared by some little 5-foot-nothing freakshow, but I now fear this man and all his wack-job friends. He makes Trekkies look like they are well-adjusted. Here’s to hoping someone shuts this thing down before it turns into another Manson-like ending. As a special treat to the readers, enjoy the following photos that will hopefully slide past the Science-tological legal-team. Just in case it doesn’t, I’ve included some legal jargon/nonsense that will hopefully keep the warlords away from me. I know, I know…I’m feeling a little crazy – wait, was that me or the mad-scientist-ologers talking?? Arrgghhhh! 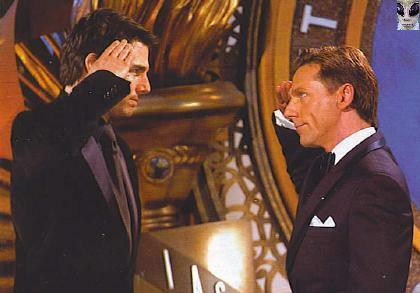 Tom Cruise giving leader David Miscavige some odd ceremonious militant salute (I’m sorry Tom…what branch of the military did you serve in again?) at the International Association of Scientolxxxxxx event, held in the U.K. in October, 2004. 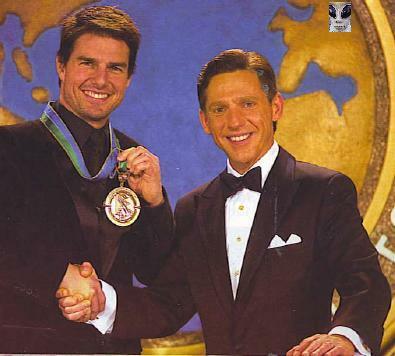 Tom displays his Freedom Medal of Valor (real name for it) as he gives a classic “alligator shake” of the cult’s leader, Commander David Miscavige.